← Revived by Delia: Next Stop On The DIY Blog Tour! I’m going to keep this post short and let the pictures speak for themselves. Remember this little cabinet, previewed here? It’s a vintage record cabinet, stained in an awesome shade of orange-y orange. I wish I had taken pictures of the inside, but didn’t. At one point there had been three vertical record separator slats, but two had been (sloppily) cut out. I cut out the third and filled in the slat holes with wood filler. 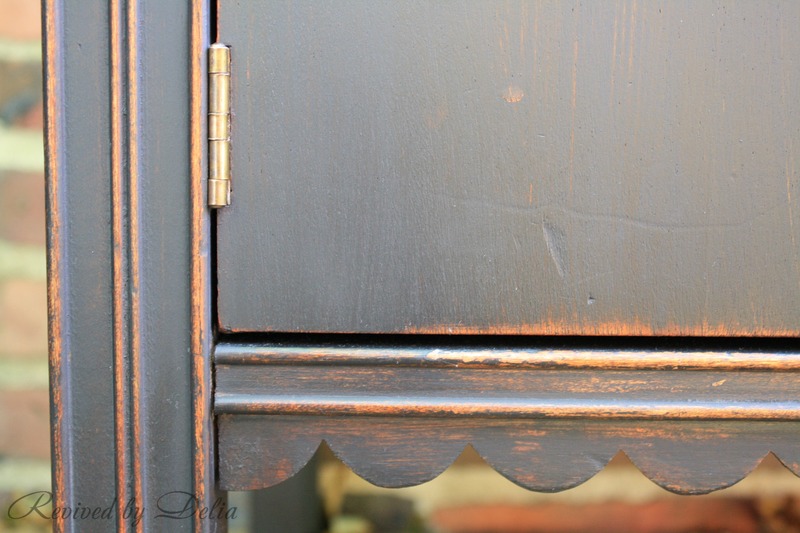 I debated over two paths with this piece… First, I thought there was a good chance that the orange would bleed through the milk paint. So I wanted a color that wouldn’t show. My two paths were… red with a handpainted design, or black with the edges distressed to highlight the details. 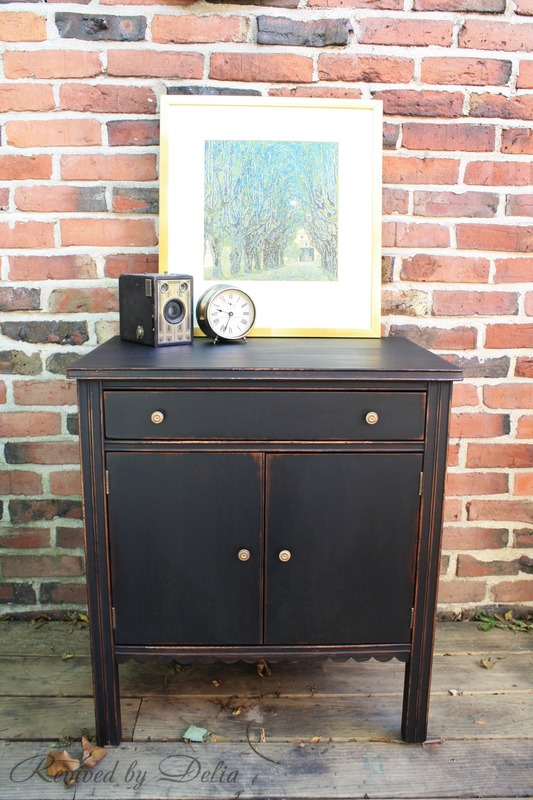 Obviously, I went with the black distressed… I used Pitch Black by The Old Fashioned Milk Paint Company. 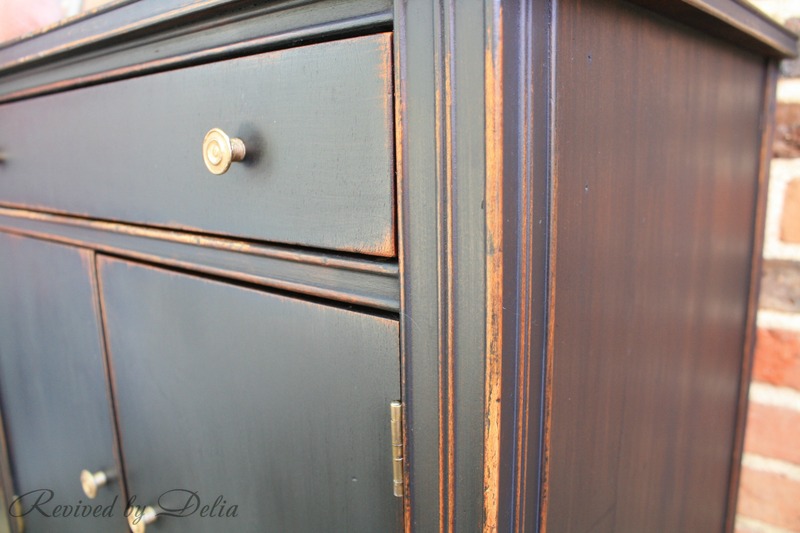 This paint is amazing and covered in one coat (mostly – I did two coats over the areas where wood filler was applied). Look at the little scalloped detail – so sweet! For the drawer liner, I wanted something somewhat masculine, but didn’t have anything that quite worked. So I stuck interesting pages from a vintage dictionary to a sheet of clear Con-Tact shelf liner, cut it to fit and voila! Leave me a comment and let me know what you think! 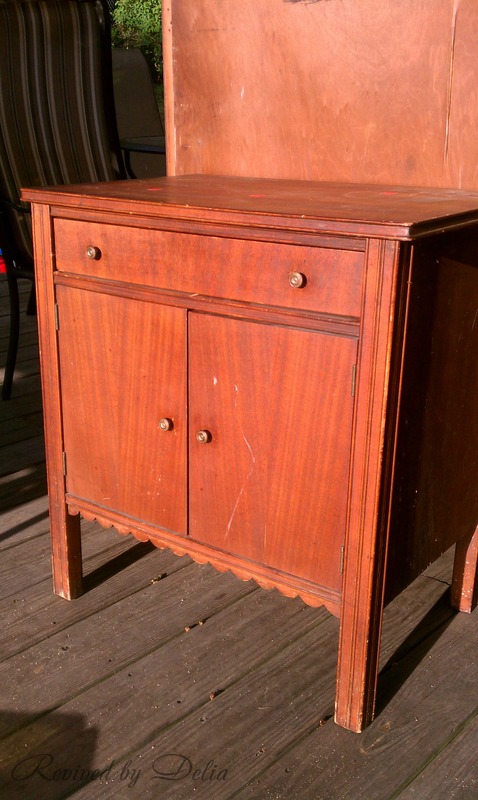 And if you’re local to Connecticut, this perfectly utilitarian little cabinet can be purchased at The Housatonic Trading Company. Good color choice. Looks great. I also really like your idea for a drawer liner. Oh, very good point! I forgot to say that part. After painting it, I distressed the edges a bit and gave it a coat of Howard’s Feed & Wax. 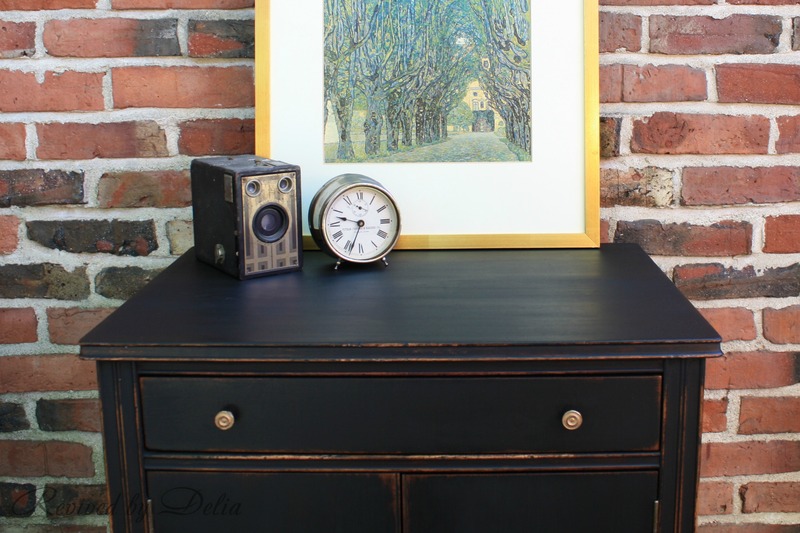 It’s a great combination of oils and beeswax, and I find works really nicely on porous surfaces like this wood and milk paint, especially black (and other darker colors – I haven’t tried it on the lighter colors, as it seems like it might alter the color). And the Howard’s is a liquid so very easy to apply! Nice makeover! It looks great! 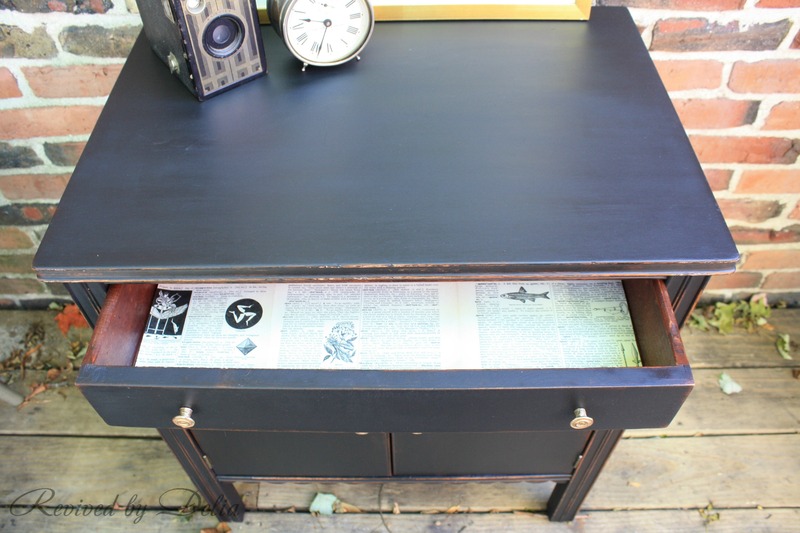 I love how black paint has the ability to make orange-y wood look amazing. You did a fantastic job on this! Oh how pretty! Black was the perfect color choice!